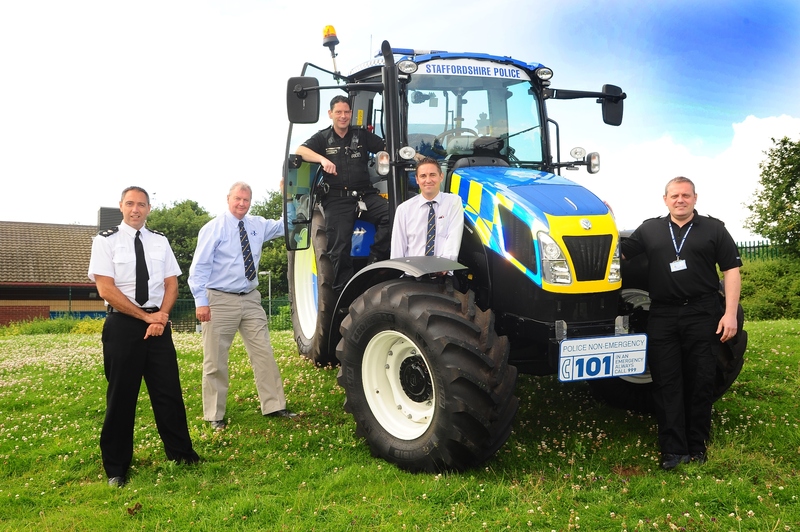 A New Holland tractor has joined the ranks at Staffordshire Police to help tackle countryside crime. The four-ton T5.105 Electro Command has been donated until November by New Holland dealership Hallmark Tractors, based in Ashbourne, to the county’s police force as a way of boosting visibility in rural areas and connecting with farmers. According to the police, agricultural communities can be very isolated and they hope the tractor – decked out in police colours – will be a high profile and eye-catching way to engage more closely with busy residents and workers. The tractor joins Staffordshire Police’s ongoing operation in which every officer, including special constables, is tasked with detecting and tackling rural and wildlife crime. Each has undergone special training and has the support of a lead officer in every local policing team. New Holland Sales Area Manager Rob Dee said: “Seeing the T5.105 in its police ‘uniform’ was a very proud moment. We’re delighted to be assisting officers to tackle crime, and reassure the farming community. As well as being used in active duty, the 107-horsepower New Holland tractor will appear at events across Staffordshire in the coming months. It was a star attraction at the force’s recent Open Day which drew nearly 7,500 people to its Stafford HQ. Inspector Geoff Knight, Commander of the South Staffordshire Local Policing Team, explained: “PC Pete Clarke, my Wildlife Officer, made the approach to Hallmark and they were more than receptive to the idea, given their close contacts in the farming community, awareness of the issues and its effects. Rural crimes, including those against wildlife, are on a downward trend in the county, according to the police. At the start of 2011, it made up over 20% of reported crime compared to 13.7% by the end of 2013.